Sen. Ted Cruz (R-TX) speaks about Obamacare during a news conference on September 19, 2013. Congress is struggling to prevent a government shutdown after Sept. 30. But Sen. Ted Cruz, R- Texas said Sunday that he’ll try to use a filibuster this week to block a spending bill unless Democrats to agree to cut funding for President Barack Obama’s health care overhaul. If no bill is passed, many, but not all, government operations will come to a halt. Last week the House passed a spending bill that includes a “defund Obamacare” provision – a bill which Cruz supports, but which Obama’s spokesmen have said he’d veto. Under Senate rules, Majority Leader Sen. Harry Reid, D- Nevada, can bring that House bill to the Senate floor and then offer a motion to delete the defund-Obamacare provision from it, leaving the rest of the bill intact. That motion would require a simple majority to pass. With 54 senators in the Democratic caucus, Reid would succeed. “Any vote for cloture, any vote to allow Harry Reid to add funding for Obamacare with just a 51-vote threshold, a vote for cloture is a vote for Obamacare,” Cruz told Chris Wallace on Fox News Sunday. For Cruz to succeed in his filibuster, he’d need at least 40 other senators to join him. 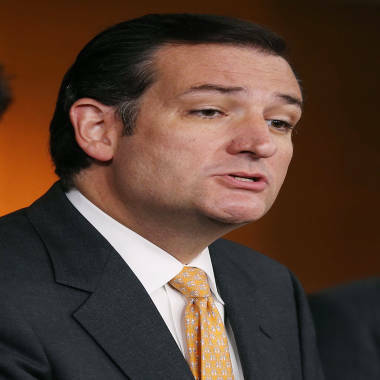 If as few as six Republicans side with Reid and the Democrats, Cruz’s attempt would fail. But there’s a difference between that vote in March – which was a simple up-or-down vote on the Cruz amendment – and a cloture vote which is likely to occur this week. Cruz said a few Democratic senators who are up for re-election next year in Republican-leaning states might be persuaded to vote with him and other Senate Republicans. She also said, “We do not want to re-litigate the battles of Obamacare again. The House and Senate passed it, the president signed it into law, the (Supreme) Court upheld it. And will there be changes in the future? Yes, but the answer is not to defund it” on a must-pass spending bill.